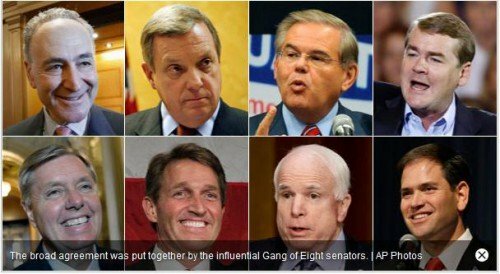 Oh Boy … Gang of Eight reach bipartisan deal on immigration reform. A powerful group of senators from both parties has reached a deal on the outlines of a comprehensive immigration overhaul, a development that will drive an emotional debate on a hot-button issue unseen in Washington for more than half a decade. The group unveiled the basics of its proposal at a Monday news conference on Capitol Hill, essentially laying down a marker on the issue one day before President Barack Obama heads to Las Vegas to unveil more details about his own immigration proposal. According to a five-page document provided to POLITICO, the sweeping proposal — agreed to in principle by eight senators — would seek to overhaul the legal immigration system as well as create a pathway to citizenship for the nation’s roughly 11 million illegal immigrants. But establishing that pathway would depend on whether the U.S. first implements stricter border enforcement measures and new rules ensuring immigrants have left the country in compliance with their visas. Young people brought to the country as children illegally and seasonal agriculture industry workers would be given a faster path to citizenship. So two RINO’s, a Cuban-American wannabe 2016 presidential candidate and three liberals have come together to pave the way for immigration reform. Who just got a queasy feeling in their stomach? Sorry, but immigration reforms begins at closing the border, PERIOD!!! Until this is done, there should be nothing and I mean nothing to pave the way for illegals to get US citizenship. The closing of the US border should be done for national security purposes, let alone keeping illegals out. We have seen these types of promises from the LEFT before under Ronald Reagan. He granted amnesty with the promise from the LEFT to later protect the borders and guess what, it never happened. I will believe this when I see it. If the GOP actually think they are going to receive the Hispanic vote for passing immigration reform they are sorely mistaken.